The most obvious difference is that the SAT test contains some math questions that you are not permitted to use a calculator on AND some that are not multiple choice questions but you must instead provide an answer on a grid. The ACT has a separate and distinct science sections, whereas the SAT mixes a few graphs/charts into the math/reading/writing sections. 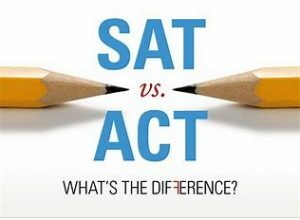 A third main difference in the SAT versus ACT distinction is the timing: the SAT does allow more time per question overall. However, I have analyzed questions from both tests and there is a difference in the rigor of the reading comprehension questions. The SAT is tougher; so, students do receive more time on tougher questions. I am not sure that extra time is a true advantage then. That being said, there are students who fare better on the SAT than the ACT. My advice is to sit for both and then for the student to determine which they liked better. Should students take these the ACT and SAT tests multiple times? The answer is a resounding “YES!” My advice to parents is to have your child sit for either the SAT or ACT with no prep to see a baseline score. Then, see what you are up against and create a plan. Another great debate in the realm of test prep is whether or not to seek a tutor for these tests. Will the money invested in tutor open doors for students in terms of opportunity or extra scholarship monies? Then of course it is wise to invest in this help, just as parents pay for strength coaches and hitting lessons and private music lessons. The ACT claims that a student will only raise their score 3 points with any type of prep work. I (and others in my field) know this claim to be completely false. The test prep process can be overwhelming. As with any aspect in life, seek help from professionals who understand the process and can guide you through the maze effortlessly. With so many ACT v SAT differences, books available to study, and simple strategies that can be learned from experts, it makes sense to seek help. Students and parents who reach out to me and mention this blog will receive my Guide To Punctuation for free. Please reach out at jenniferchenson@msn.com after looking over the program materials at www.jenhensonactprep.com. Jen Henson ( a.k.a “The GOAL DIGGER”) is a nationally sought after test prep expert specializing in the ACT test. Jen, who was Winton Woods City School’s (OH) Teacher of the Year in 2014, holds a Master of Education degree with a Bachelor’s in English from Xavier University—where she was a walk-on tennis player. She’s taught 21 years and coached ACT prep for over 9 years– and has an army of teachers trained to assist her requests for tutorials. Her former ACT students now attend notable higher learning institutions, including Notre Dame, The Ohio State University, Texas A&M, The Naval Academy, and the University of Kentucky—among others. Jen has assisted students from California to Connecticut—and states in between—to reach their personal ACT goals. No score is too low or too high, as she has doubled the scores of students starting at the low end, in addition to helping initially higher scoring students achieve the coveted 36 on every section of the test. Two young men playing D1 football had a composite score of a 9 originally, and scored 18 and 20 (respectively) after working with her. Two of her former clients now have NFL experience, 2 are in the MLB program, and one is a WNBA standout.